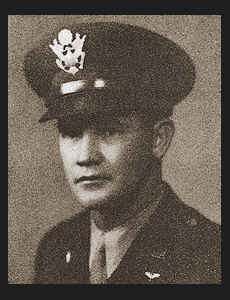 1st Lt. Buck L. Whitworth, son of Mr. and Mrs. E. L. Whitworth, graduated from Frederick School. Entered Air Corps in Jan., 1941, trained in Abilene, Ellington Field, Texas, Tampa, Fla., and Alamagorda, N. M.; served in Italy; was discharged in Nov., 1945. Awarded Air Medal with six Oak Leaf Clusters, ETO Ribbon with four Battle Stars, Pres. Unit Citation.